CMS800G Fetal Monitor can provide different configurations according to different user requirements: FHR1(Ultrasonic Channel ? ), FHR2 (Ultrasonic Channel ? ),TOCO, FMOV (Fetal Movement Marker).Monitoring results can be recorded by built-in recorder for continuous or intermittent records. The monitor can be used individually or connected Interface for the purpose of central monitoring. requirements: FHR1(Ultrasonic Channel ? ), FHR2 (Ultrasonic Channel ? ),TOCO, FMOV (Fetal Movement Marker).Monitoring results can be recorded by built-in recorder for continuous or intermittent records. The monitor can be used individually or connected Interface for the purpose of central monitoring. Interface for the purpose of central monitoring. This Maternal & Fetal Monitor PC-8000pro with twins monitoring function, can monitor Fetal Heart Rate (FHR), Uterine Contraction Pressure(TOCO), Fetal Movement(FM),NIBP, SpO2, PR, ECG, RESP and TEMP measurement. 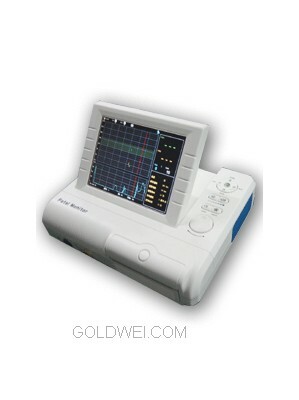 Fetal Monitor PC-800pro is used to monitor TOCO,FHR & FM. Model CMS800 Fetal Monitor, is a lightweight, space-saving fetal monitor, ensure external and internal monitoring parameters.It can be used up to and during the second stage labor. It also can be connected to the obstetrical central station to construct central monitoring system.